In an age where both nimble, young companies and behemoths are trying to reposition themselves as omni-channel retailers, there are plenty of insights to draw from across the board. Young companies and startups are scrappy and can execute more quickly on their vision — but the larger companies have the resources to make large scale change happen rapidly once they get their feet on the ground. These best practices and pieces of advice from all sorts of companies, as well as high points and mistakes, serve not as an instruction manual but as a set of sign posts. Given its recent $310 million acquisition by Walmart, it might be easy to forget that Bonobos started off as an independent fashion company focused on men’s pants. Founded in 2007, Bonobos had a vision about how they could connect with their visitors and customers in a deeper way. During this process, in addition to the cash infusion, selling more, gaining greater exposure, and building a deeper in-person brand experience with existing buyers and customers, Bonobos became a true omni-channel retailer and put together a playbook for opening their own retail operation. And the rest is history. 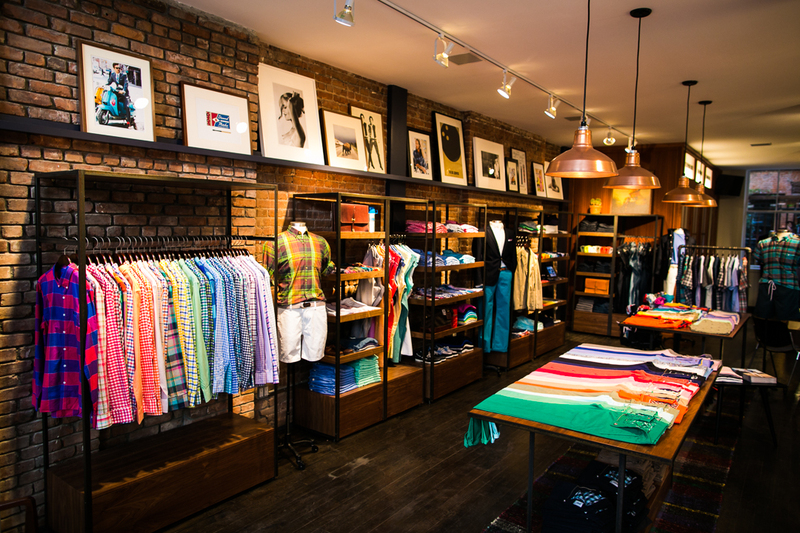 In 2015, Bonobos set up 17 “guideshops,” stores where visitors could browse and buy online, but could not take any products home. This kept inventory and operations simple, but still came with the benefits of touch — a barrier that so many people value, but most ecommerce companies haven’t broken through yet. This type of gradual evolution, and symbiotic education, has been replicated by many ecommerce pure-play brands. Casper, for instance, just signed a distribution deal to appear in over 1,200 of Target’s stores, expanding well beyond their pop-up stores. And of course, sometimes, it goes beyond distribution — a few months ago, PetSmart bought Chewy for $3.35 billion to marry well established physical and ecommerce brands, who will no doubt, both amplify each other’s strengths. Ready to expand your channels? Shopify Plus makes it easy to go everywhere your customers buy by combining 16 different sales channel — including social, Amazon, and a POS for retail and pop-up shops — all within a single commerce backend. Omni-channel data is an extremely valuable asset. It can make the difference between a successful expansion and a belly flop. Keeping this data in mind when setting up your omni-channel infrastructure will make things smoother. And whether you want to call it a minimum viable product or a risky assumption test, make sure you find the lowest cost and time investment to experiment. This will be crucial to omni-channel success. “We are able to conceive an idea, test it and bring to market within two weeks,” Warby Parker co-CEO Neil Blumenthal says. Similar to Warby Parker, Ulta also practices testing in small volumes, adding new products to its ecommerce site first before typically bringing them into stores two weeks later. This is because they noticed their customers webrooming, and checking the websites before buying products in store. Two weeks gives people enough time to learn about a new product, decide if they like, and make plans to go into the store. Fashion retailer Stitch Fix works as their customers’ stylists to personalize recommendations. In fact, it goes a step further than most ecommerce websites — Stitch Fix’s algorithms selects the clothes its customers would like, and ships those items to them. Customers send back items they don’t like without any charge, as Stitch Fix offers free shipping both ways. Algorithm aside, can you imagine how your customers would appreciate that — shopping literally from the comfort of their own homes, combined with the instant gratification of keeping certain products? It’s similar to what Frank & Oak does with their Style Plan. For merchants already with brick-and-mortar stores, don’t forget to integrate technology with them. That could be as simple as arming each employee with an iPad, so they can search much more quickly and comprehensively, and be of greater service to customers. REI’s far from the only example — in fact, according to e-tailing and eMarketer, 60% of brick and mortar stores use tablets to enhance the customer experience. This addition is similar to Ulta’s perspective on omni-channel — it’s all one experience. When visitors get more familiar with the website in store, or vice versa, they get more immersed into your business and brand. Showrooming and webrooming are just words that mark how people like to shop these days. There’s no point working against these natural tendencies. “We see people buy furniture online. We introduced buy online and pick up in store and buy online and ship to store [without any shipping fee]. We are trying to use that to drive store traffic. When they come in, we give them bounce-back coupons,” said Michael Relich, COO of home furnishings and furniture retailer Crate and Barrel. Because there are so many different channels, each with different completion and conversion rates, it’s easy to overlook the influence each channel has on each transaction. “Retailers need to align incentives around omni-channel. Too often, stores are given credit for stores sales and ecom is incentivized on ecom sales, which lead to less of a seamless experience. Consumers don’t care about how you are organized. You got to make it seamless,” said Relich. The typical ecommerce experience just can’t win everyone over. Some people want to buy now. Some people don’t want to pay for shipping. Some people will swear by their in-store experiences — checking the fit on their clothes, how heavy each article of clothing might be, and how it looks not in a photo but on them. Understandable, right? This is why clothing retailer Zumiez set up their infrastructure to enable flexible purchases. Their point-of-sale platform enables people to purchase from all channels — and visitors can reserve/buy online and pick up in-store same day (near-instant gratification without dramatic shipping costs), ship from any store to any location, and order online from the store. Similarly, Walmart announced that they would work with their retail workers for delivery. As always, in business, it’s important to consider every single asset and to leverage them into your advantage. Keep in mind as you’re shipping your experiments that real people — visitors, buyers, and customers — will be seeing them and shopping. Make it easy for them to purchase. Trying an experimental product or a channel shouldn’t be any different from them purchasing at a more standard one. This type of omni-channel ordering is made possible by a strong backbone. The Wall Street Journal reports that Nordstrom spent millions of dollars the company invested in technology in recent years has gone toward tools that would help manage inventory. Investing in your product product information management (PIM) not only loosens up cashflow, but also reduces costs and gets products out the door faster, improving business performance. And of course, not to be forgotten is Nordstrom’s display experiment in 2013, in which they organized their store by displaying products according to popularity on Pinterest. Visitors might treat every channel as one experience — but they sure don’t behave the same way in each one. So while you must make them fit into one cohesive whole for the visitors, you also have to make sure you understand each one’s function. For example, do people webroom or showroom more for your business? Which channels generate awareness, which ones influence purchases, and which ones do people actually buy upon? What about at peak buying season? Staples noticed that customers shop earlier than ever on Black Friday, so “by offering mobile deals starting at 11 p.m. the night before, we’re providing them the opportunity to shop when they want to, and will continue the deals when our stores open at 5 a.m. the next morning,” says Prat Vemana, director of mobile and Staples’ Cambridge, MA-based Velocity Lab to Retail Dive. And even with the exclusive deals and knowing how people behave as an aggregate at each channel, the next level is knowing each customer as an individual. Staples Chief Digital Officer Faisal Masud says that despite being a loyal Nordstrom customer, “I continue to see random emails from them about products that I don’t really buy or ever plan to buy–although they know my size, they know the brands I buy, what I buy, and how much I buy.” Setting up the infrastructure to understand this not only requires the data from your ecommerce stores, but also in-store technology (see point #5). Instead, in addition to setting clear channels of communication for your organization’s leaders (see point #3), set aside resources to create a team whose specialty is bringing together and accelerating omni-channel experiences. Footwear retailer DSW calls this team their Transformation Team, whose mission is to usher omni-channel into their organization, which previously had no technology support from within. "Once we have a project that is cross-functional with major impacts, we use the Transformation Team to help transform the entire process," DSW SVP and CIO Ashlee Aldridge says. In addition to that initial catalyst work, each quarter the Transformation Team ensures the analytics are meeting business objectives and determines whether DSW can move on to their next project. While your organization may or may not be playing catch up like DSW was (it sank $10 million into omni-channel initiatives in 2015), you’ll still need to innovate in order to make sure you’re keeping up with customer expectations and behavior. Ten retailers, ten manifestations of the common trends and strategic patterns (webrooming and showrooming, testing small and moving quickly, and creating a singular experience). When moving forward in your own transition in omni-channel, keep these bigger picture goals as your north star to make sure you’re moving in the right direction. And remember, while a lot of this change requires new technology to execute, the most difficult parts of it will require new methods of thinking, new organizational structures, and new ways of collaboration. Will your team be up to the challenge?